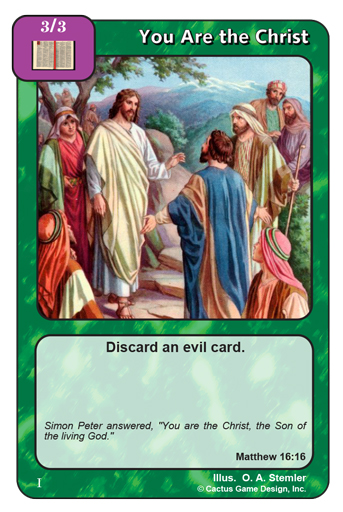 Redemption is a collectible trading card game based on the Bible. Heroes attempt to rescue lost souls, overcoming any evil characters that oppose them. Two to five players race to rescue a set number of lost souls before their opponents do the same. This site contains information for all Redemption players, as well as info specific to players from California. Enjoy your visit! June 29, 2013 - State - 9:30 a.m. - $7 entry fee. and the new Tin for Booster Draft ($17). Those new cards will NOT be legal for open decks at the State tournament. The new cards will be legal for ALL categories at the Regional tournament. The previously reported date of July 16 is in error. The correct date for the Redemption SW Regional tournament is July 13. 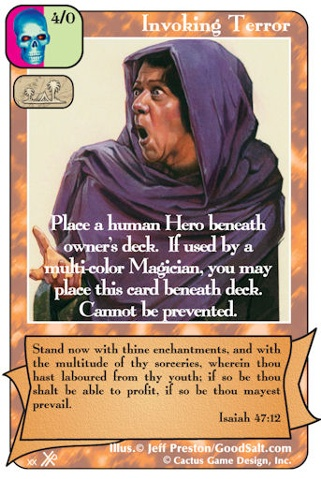 The Invoking Terror image above was used because it is the favorite art of one of my favorite Redemption players. You're welcome, Brandan! Thank you, Michael, for finding the error. For rulings on cards, check out the Redemption REG. in whom we have redemption, the forgiveness of sins." This site is designed and maintained by Bryon Hake. Best viewed with Internet Explorer. Please e-mail me with comments, questions, or suggestions.